On the edge of Chinatown next to 880 is this rusted sign. The neon is in surprisingly good shape, as are the numerous small bulbs around the edge. 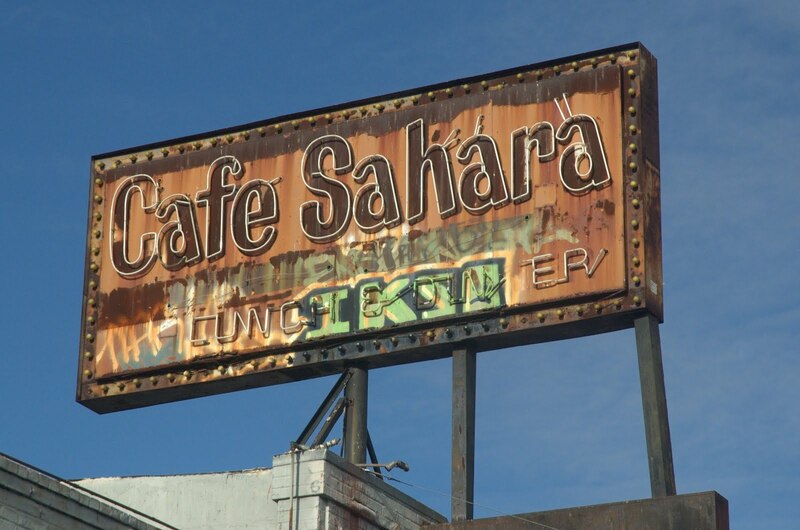 I can't find any info about Cafe Sahara, though, just other pictures of the sign and graffiti-covered building. One photo mentions a fire in 2004 and $200,000 worth of marijuana plants that were discovered, but that's about it. Anybody know more about it? update: See the entry at Oakland Wiki where @policyhobo has been investigating the Cafe Sahara story. I remember when it was a going concern. It always had a reputation as a dive. I'm glad the sign has been allowed to rust in peace. My brother had his wedding reception there in 1972 when it was called Frere Jacques. Then it became the Cafe Lakora, and the last change seems to be the Cafe Sahara. Several local bands used it to practice in and for a while it claimed to be a sewing shop. It was very nice in it's heyday, now sadly ignored.